A Ground Control station (GCS) is a land- or sea-based control center that provides the facilities for human control of unmanned vehicles in the air or in space.When talking about a rover it can be as simple as a remote control device. In this file the MavLink protocol is implemented and adapted to a rover.Remote control methods and sensors (rate control, attitude stabilization, yaw, altitud...) are enabled. Defines some variables and stablish the default configuration for sensors. You can fingure out what each sensor configuration does here as part of GCS_MAVLink/include/mavlink/v1.0/common/common.hfile. Stablishes the system status to ACTIVE and the control mode. Checks if the failsafe event is set (it means triggered() returns something different from 0). In case the failsafe event is set the status is changed to CRITICAL. Depending on the control_mode some variables are defined.The MAV_MODE_GLAG are defined as part of PX4 firmware, you can find the definitions here. MAV_MODE_FLAG_AUTO_ENABLED:autonomous mode enabled, system finds its own goal positions. Guided flag can be set or not, depends on the actual implementation. At ardupilot/libraries/GCS_MAVLink/include/mavlink/v1.0 you can find all these identifiers. Remote control input is (MAV_MODE_FLAG_MANUAL_INPUT_ENABLED), in case the control mode is not INITIALISING. The Hil mode is defined in the APMrover2/config.h.As mentioned before, the simulation Hardware-in-the-loop (HIL) is a technique used for the development and testing of complex embedded systems in real time. First this code checks if HIL is enabled in some way. MAV_MODE_FLAG_HIL_ENABLED also enables hardware in the loop simulation (all motors / actuators are blocked, but internal software is full operational). After that MAV_MODE_FLAG_SAFETY_ARMED sets MAV safety to armed. Motors are enabled / running / can start, that means: "Ready to fly". Then MAV_MODE_FLAG_CUSTOM_MODE_ENABLED is used to set a custom mode(a bitfield for use for autopilot-specific flags). You can find the implementation of mavlink_msg_heartbeat_sendhere, for sending a heartbeat message. NOTE- mavlink_msg... can be found at /GCS_MAVLink/include/mavlink/v1.0/ardupilotmega or at /GCS_MAVLink/include/mavlink/v1.0/common. get_gyro() return a smoothed and corrected gyro vector. (x,y,z) for position of the certer of gravity respect to a non-inertial system. 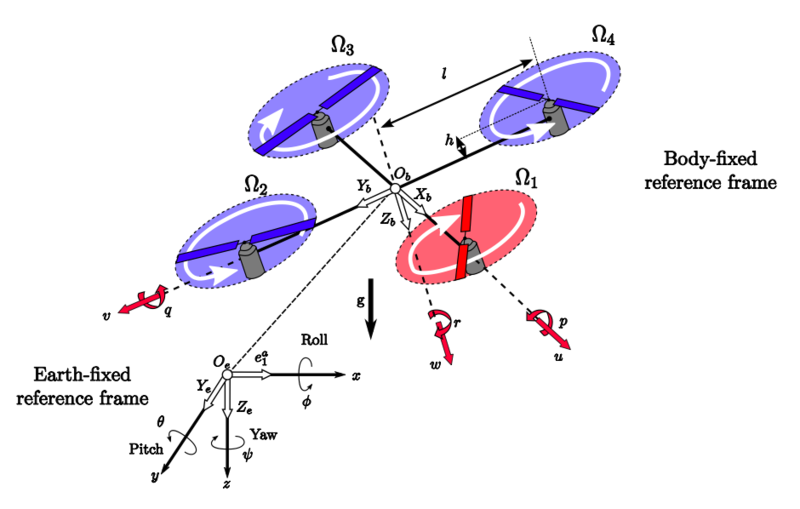 (roll,pitch,yaw) for orientation relative to a body- fixed system (inertial) . Note that the position of a body is perfectly determined with both the position of a point (GC) and the rotated angles relative to a given position. This initilized contol_sensors_present to the default sensors stablished in the firts line of this code. Enables the GPS sensor and the Magnetometer sensor if they exist. Depending on the control_mode input different sensors are enabled. This slice of code check if a device is connected and enabled in a healthy way.Depending on this initialize the corresponding sensor.That means, this slice is a health controller. For example: ahrs.healthy() checks if the AHRS subsystem is healthy (boolean function). If it is unhealthy MAV_SYS_STATUS_AHRSis called to find out the AHRS subsystem health. mavlink_msg_sys_status_sendimplemented here sends a message showing the status of the system. The message includes data about: which controllers and sensors are present, which are enabled, which controllers and sensors are operational or have an error...(Value of 0: not present. Value of 1: present). // use the current boot time as the fix time. Some notes about the functions called. last_fix_time_ms() returns the time we got our last fix in system milliseconds. This is used when calculating how far we might have moved since that fix. gps.velocity()returns 3D velocity in NED format. location()returns the location of last fix. yaw_sensor is an AP_InertialSensorexported to AHRS, which can be defined as, a gyroscopic device that measures a vehicle’s angular velocity around its vertical axis. current_locis a Location instance. ALl location functions are stored in [AP_Math] The information returned by all these functions is used when calling mavlink_msg_global_position_int_send, implemented here. send_nav_controller_output is implemented here and sends a nav_controller_output message. nav_bearing_cd() returns the tracking bearing that the navigation controller is using in centi-degrees. This is used to display an arrow on ground stations showing the effect of the cross-tracking in the controller. target_bearing_cd()returns the target bearing in centi-degrees. This is the bearing from the vehicles current position to the target waypoint. crosstrack_error()returns the crosstrack error in meters. This is the distance inthe X-Y plane that we are off the desired track. If HIL_MODE is enabled send amavlink_msg_rc_channels_scaled_send implemented here.This send instructions to the corresponding channel, in this case: steer and throttle control channels. If the HIL_MODE is disabled calls mavlink_msg_servo_output_raw_send implemented here. Send a message to the servo output port for using RCOutput read() method to read back current output state, as either single channel or array of channels. If HIL_MODE is enabled uses RC_Channel manager. void simstate_send(mavlink_channel_t chan);for reporting the state.Implemented here. mavlink_msg_hwstatus_send implemented here is used to sent Vcc- board voltage (mV) and I2Cerr- I2C error count. Using sonar methods implemented here report smaller distance of two sonars if more than one enabled. Then using mavlink_msg_rangefinder_send, implemented here, sent a message with the distance in meters and a raw voltage if available(zero otherwise). mavlink_msg_mission_current_send implemented here for sending a mission_current message, which reports the mission command in Mavlink.For this aim get_current_nav_index is used: get_current_nav_index returns the current "navigation" command index. Note that this will return 0 if there is no command. This is used in MAVLink reporting of the mission command. This code sends a message as implemented here. severity of status. Relies on the definitions within RFC-5424(RFC 5424 is The Syslog Protocol). Status text message, without null termination character. // are we still delaying telemetry to try to avoid Xbee bricking? Telemetry is the highly automated communications process by which measurements are made and other data collected at remote or inaccessible points and transmitted to receiving equipment for monitoring. Now we try to delay telemetry using telem_delay defined here. Notice, that it is checked if the usb is connected or not, with usb_connected , which return true if USB cable is connected . This slice of code checks if we j¡have remaining time for sending a message. This case involve MSG_ varibles. To ensure we never block on sending MAVLink messages each MSG_ is keept to a single MAVLink message. For example: In case MSG_ATTITUDEthe previously defined function send_attitude is called. All the options in this case are used in a similar way. The GroupInfo structure is passed by the main program in setup() to give information on how variables are named and their location in memory. It is defined here. AS you can see the scheme is similar to the explained one. This slice of code checks if the stream parameters are set in a such a way that a new stream should be sent. Note: We have to set in_mavlink_delay to prevent logging while writing headers. if stream triggerfills the passed parameter then send_messageis called. send messageis defined here and sends a message with a single numeric parameter. This may be a standalone message, or the GCS driver may have its own way of locating additional parameters to send. The quided_WP is updated to the location value. The set_modefuntion is implemented in system.pde including a case for selecting the control mode(Guided,manual,hold...). The set_guided_WP()funtion defined in APMrover2/commands.h copy the new location value to wp. This funtion is not implemented yet. If MAVLINK_MSG_ID_REQUEST_DATA_STREAM, then handle_request_data_stream is called for sending a date request. Then if MAVLINK_MSG_ID_COMMAND_LONG then mavlink_command_long_decode for decoding a command_long message into a struct. If the mount is enabled and MAV_CMD_DO_SET_ROI sets the region of interest (ROI) for a sensor set or the vehicle itself. This can then be used by the vehicles control system to control the vehicle attitude and the attitude of various sensors such as cameras. There are three cordinates needed to pin down the position. Case MAV_CMD_MISSION_START starts running a mission .first_itemis the first mission item to run; last_item is the last mission item to run (after this item is run, the mission ends). Case MAV_CMD_PREFLIGHT_CALIBRATION tiggers calibration. This command will be only accepted if in pre-flight mode. For example: Gyro calibration: 0: no, 1: yes. Till here there is a case implemented with MAV_CDM commands. Each case acts in a similar way to the above explained ones. Here you can find the function of each NAV_CDM. Each of this MAVLINK_MSG_ID has its own .hfile, where it is defined. For example MAVLINK_MSG_ID_MISSION_ACKis defined in mavlink_msg_mission_ack.h file. Similarly, the rest are defined in their correponding .h file stored at /GCS_MAVLink/include/mavlink/v1.0/common. This slice of code checks the delay in mavlink messages and makes the corresponding GCS updates. You can find de GCS_class methods definition here.Note that gcs is an instance of GCS_CLass: initialised sets to true if this GCS link is active bool initialised. send_message sends a message with a single numeric parameter. Here the data_stream_send() send streams which match working frequency range. The update method updates GCS state. This may involve checking for received bytes on the stream, or sending additional periodic messages. The send_textmethod sends a text message.Where the parameters are: severity(a value describing the importance of the message) and str (the text to be sent). pending_statusrefers to message that are in the queue.This slice of code try to send this pending messages. This funtions retries sending deferred messages.